If there’s a particular time of the year to wear a gold Rolex watch, the festive holiday season is as good as any! However, if you’re anything like us, a gold Rolex watch is pretty much always appropriate. Whether you’re looking to gift something special this year or want to dress up your own wrist with a lavish luxury watch, give these gold Rolex watches a gander. 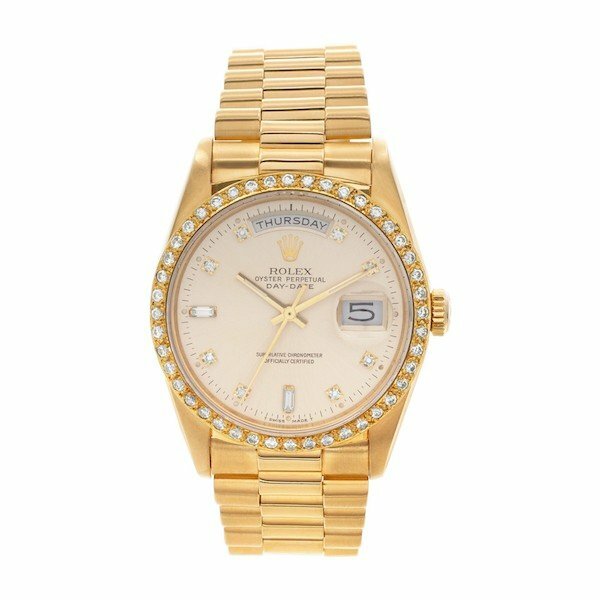 In the realm of classic luxury watches for women, it’s hard to beat the appeal of a yellow gold Rolex Lady-Datejust President. Not only does this ultra-luxe women’s watch sport the iconic waterproof Oyster case in a refined 26 mm size topped with the famed fluted bezel, but it is also paired with the coveted President-style bracelet. Characterized by its semi-circular links, the President bracelet is by far one of Rolex’s most famous designs. Contrasting with the lush yellow gold construction of this Rolex ladies Datejust watch is the crisp white dial with matching yellow gold Roman numerals–and of course, the must-have date window at 3 o’clock for which the watch is named after. For a women’s gold watch with a touch more sparkle, there’s the yellow gold Rolex Pearlmaster flaunting some dazzling diamonds. With a dozen diamonds set into the bezel of the 28 mm case to the ten diamond hour-markers on the mother-of-pearl dial, this is a yellow gold Rolex watch that offers plenty of shine for this holiday season. The Pearlmaster timepiece takes it names after its bracelet, which features a graceful five-link design. The bracelet’s curvy silhouette completes the beautiful look this women’s solid gold and diamond Rolex watch and wears like a piece of fine jewelry. While the majority of Rolex watches comes with metal bracelets, the company has made a few models with elegant leather straps. 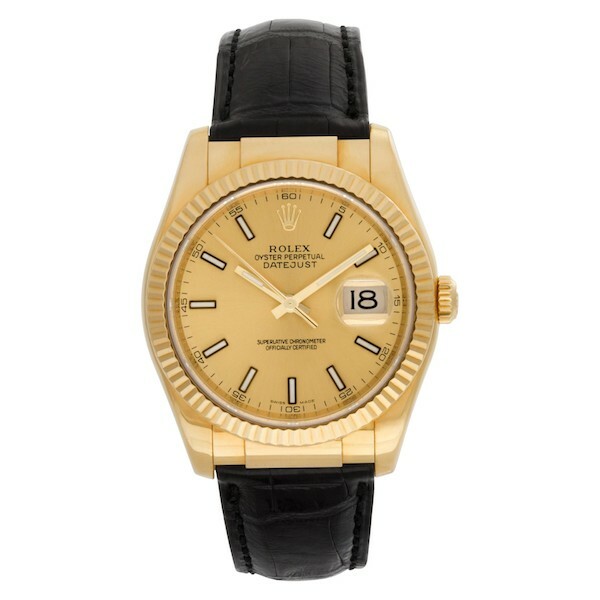 Case in point is this very attractive yellow gold Rolex Datejust 36 presented on a classic black leather band. Sized at a very wearable 36 mm, this Datejust fits a wide range of wrists especially with the adjustable 18k yellow gold deployant clasp fitted on the leather strap. Carrying on the monochromatic style of the yellow gold case and the yellow gold fluted bezel is the matching champagne dial, which houses luminous baton hour markers with black surrounds and the 3 o’clock date window. The quintessential dress watch that will never go out of style, a yellow gold Rolex Datejust simply looks great when paired with a dark leather bracelet. Since its debut in the 1950s, the Rolex Day-Date watch has become synonymous with success and style. 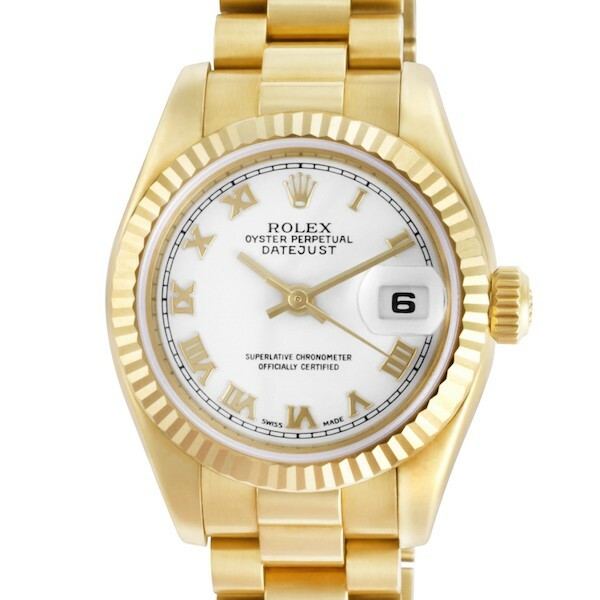 Nicknamed the President in part because of its bracelet but also because it’s the must-have watch within the world’s most powerful circles, the Rolex Day-Date is most recognizable when dressed in solid yellow gold. Yellow gold from head to toe, this particular Rolex President is further embellished with a custom diamond-set bezel. What’s more, the original cream dial gleams with ten diamond hour markers, leaving just enough room for the pair of calendar windows at 12 and 3 o’clock. There are Rolex Daytona chronographs and then there’s the show-stopping yellow gold Rolex Daytona with a black mother-of-pearl dial and black leather strap. Featuring the familiar Daytona case with the duo of screw-down chronograph pushers framing the winding crown, this Rolex chronograph wears larger than its official 40 mm size suggests. Plus, there’s also the tachymeter-engraved bezel that lends a sporty (and functional) touch to the overall appearance. The dial looks especially dramatic thanks to the striking way the dark mother-of-pearl surface changes depending on how the light hits it, not to mention the yellow gold Roman numerals along the periphery. 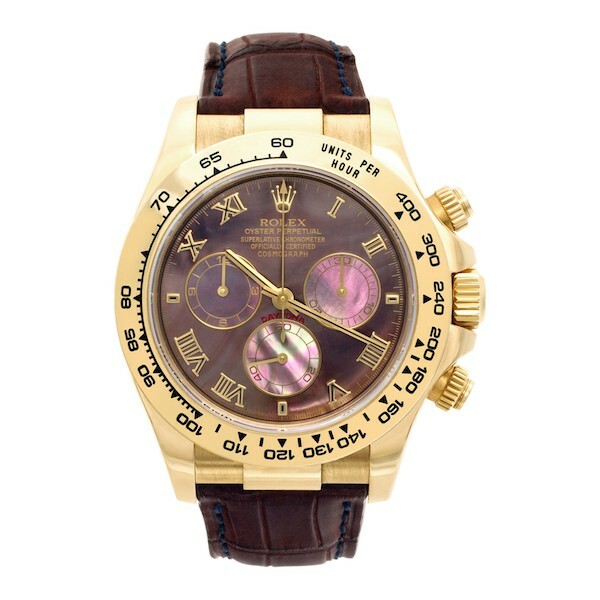 So if you enjoy gold watches but prefer a sportier design over a dress timepiece, then a yellow gold Daytona is in order. If you love a gold Rolex President but typically wear bigger watches then the Day-Date II is the ideal choice. Boasting a 41 mm case (which is much larger than the traditional 36 mm case size) the Day-Date II is a head-turner indeed–especially in full 18k yellow gold from case to bezel to bracelet. Although Rolex no longer makes the Day-Date II ever since it was replaced by the Day-Date 40 a few years back, the biggest Rolex President watch ever made is still highly coveted in the secondary market. 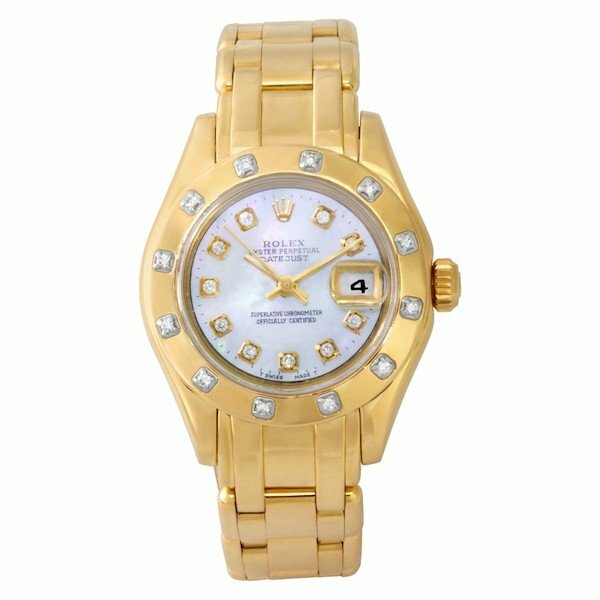 Proudly oversized, opulent, and iconic, this the yellow gold Rolex watch that says it all. 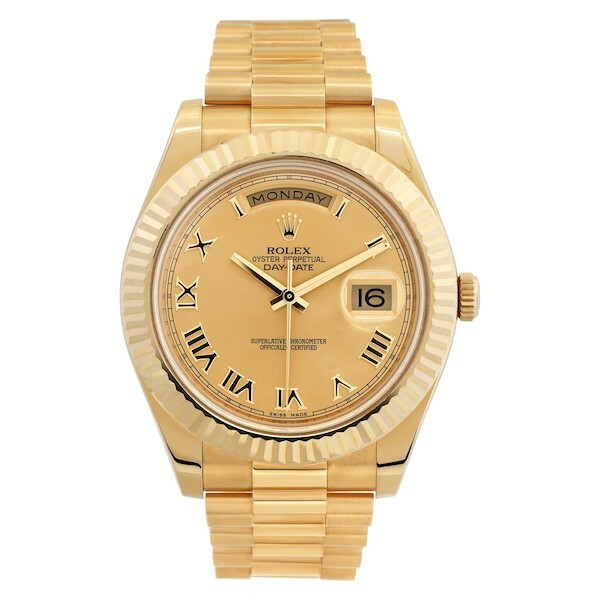 If you have had your eye on a gold Rolex watch then there’s certainly plenty to choose from. 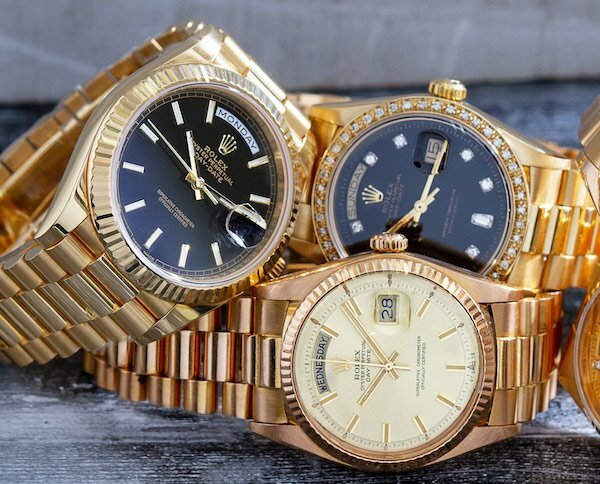 From dressy to sporty, small to large, at Gray & Sons, we have a wide range of pre-owned yellow gold Rolex watches in our inventory to browse through. Cheers to an iconic luxury watch to ring in the new year!